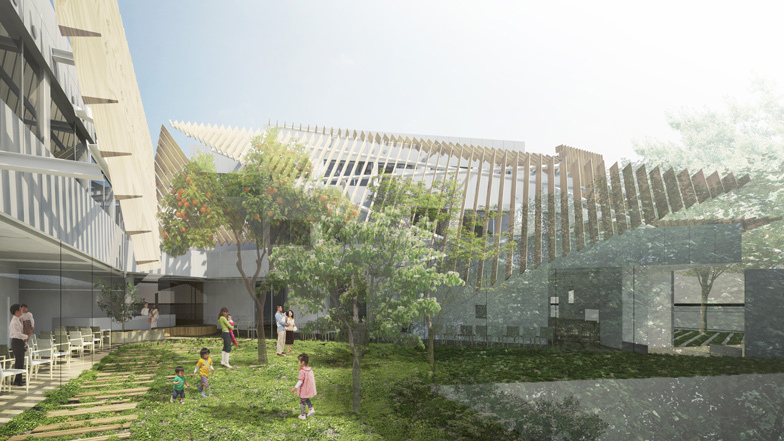 News: Japanese firm Kengo Kuma + Associates has unveiled plans to replace an ageing Tokyo medical centre with a louvre-clad hospital built around a landscaped garden. The new Seijo Kinoshita Hospital will take the place of a long-standing medical facility in Setagaya, south-west Tokyo. Set for completion in early 2017, the 2,400-square-metre facility will feature an upgraded maternity ward. After consulting with both doctors and patients, Kengo Kuma's firm developed a design intended to encourage staff and visitors to interact with nature whenever possible. The building will be organised around various green spaces and terraces. Proposal images show waiting rooms fronted by floor-to-ceiling glazing, allowing them to open out to a central courtyard featuring several trees. The architects also plan to clad the exterior with timber louvres arranged as triangles. These are expected to offer shade, but also to control sight lines towards the more scenic areas of the surrounding landscape. Communal areas and individual patient rooms will be naturally lit wherever possible. Kengo Kuma and Associates has offices in Tokyo and Paris. The firm recently completed the interior of a Camper store in Milan and is currently working on the new outpost of the V&A museum in Dundee, Scotland. It has no major healthcare buildings in its portfolio, but previously completed a pharmacy and clinic in Kanagawa Prefecture.